Yesterday's blargh moments required antidotes. 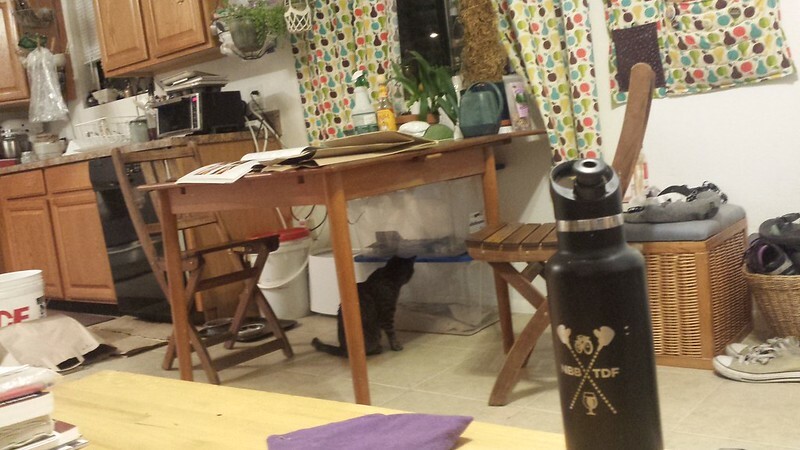 So first, here's a picture of Emma watching the crickets. I guess she's an entomologist, too. But she's shy about it - if I try to take a picture up close, she just gets up and walks away. Second, after the blarghy day and everything, I became determined to actually make it out on the local Tuesday night social bike ride. I had to apply a few cattle prods to myself, but I managed, and am glad that I did. We took a great route along a network of interconnected river/canal paths from Tempe through Mesa to Gilbert, then back again. Tempe and Mesa have been continuing to develop the canal paths to form an alternate network across the greater Phoenix suburb-o-politan area, to great effect. One of our first legs took us along the recently-constructed "Stadium Connector", a blissful extension of the path that runs along Tempe Town Lake's south shore. From there, we were able to transition smoothly onto 10th Street, taking advantage of a new two-way separated cycle track on Alma School Road, and then hopped onto the Tempe Canal, which continues east and then bends south and becomes the Consolidated Canal Path. The Consolidated Canal Path ends at Lindsay Rd, but then it's a quick hop over to the Western Powerline Trail. Most of the group then stopped for food and drinks at OHSO Brewery, but it was already past Grandma Bedtime by then (9 pm), so I carried on. The Western Powerline Trail feeds straight into the Western Canal Path, which continues westward back into Tempe. The only real adventure of the ride, for me, was reaching a stage somewhere in there where suddenly I was feeling some really strange, inexplicable, jolting crotchal pains - the insides of my thighs were smarting, and I couldn't figure out why. At that moment I chalked it up to not being in great cycling shape. It wasn't until this morning that I connected that experience with a rider's earlier question about whether any of the rest of us were getting shocked by our bicycles while riding underneath the power lines. I hadn't thought I was, but I guess I was, after all. Kinda freaky. I didn't make it home until 10:30, so I didn't make it out of bed to row this morning. Ah well. It was good to get out and move my body and explore new places. And the next time I go bike camping along a route that goes through Mesa, I will 100% take the Stadium Connector. We used to take Rio Salado, which is fine, but not a route that one eagerly looks forward to. The Stadium Connecter, however, is destination riding material. Good stuff. And nothing else terrible happened, thankfully, which is good after the earlier bummers of the day. Also, keeping myself off of the Tweet-machine during working hours is going to be hard, which tells me that it's definitely a necessary move. I need to find other ways to pause for mental breaks during the workday - ways that aren't so dangerously distracting. This entry was originally posted at https://rebeccmeister.dreamwidth.org/1224121.html. Please comment there using OpenID.